To celebrate their debut release WORK, Wooden Cities is pulling out all the stops to launch the album in true Wooden Cities fashion - by playing selections from their past and present, including John Zorn's seminal work, Cobra, the first piece in the group's expansive repertoire. The first half of the concert will feature works that draw on Wooden Cities' many forms. Gertrude Stein and Marina Blitshteyn's poetry speaks through new arrangements from ensemble members Evan Courtin and Ethan Hayden. Matt Wellins' Dead Room turns pressed paper and cardboard into sound and action through manipulation and destruction all while closely amplified with contact microphones. Cardew's Red Flag Prelude, carefully orchestrated by Associate Director, Ethan Hayden, observes the human cost of mining, the title recalling a piece of bloodied clothing a Welsh miner waved as a flag during a labor protest. Kagel's Con Voce showcases the ensemble's penchant for theatrics - something to only be experienced live. Add John Zorn's explosive game piece Cobra with a who's-who list of top Western New York players, and the night is not to be missed! After eight years of performing, Wooden Cities' first release in a trilogy of upcoming albums on Infrasonic Press grapples with work, labor, commodity, and justice. The record's three pieces have sat lost to time and have been constructed and reconstructed through careful research, including dialogues with original performs, direct accounts, and other sources. This is WORK. Wooden Cities is both a collective of performers and composers seeking to help increase the performance and awareness of contemporary music in the Western New York area through unique concerts and educational presentations. Formed in July 2011, the group initially served as a vehicle for director Brendan Fitzgerald to present John Zorn's game piece Cobra. Since that time, the group has grown to include nearly a dozen performers and is constantly seeking new works by new composers while continuing to present works by some of the essential, yet underrepresented composers of the 20th and 21st centuries. Wooden Cities has spent the last eight years committing themselves to presenting exciting new music from a wide spectrum of sources. The ensemble has premiered over twenty works by composers from around the world, including Girilal Baars, Ryan Ross Smith, Jeffrey Stadelman, Matt Wellins, and its own members. As a collective of composers and arrangers, Wooden Cities has created an extensive repertoire of new concert music, re-interpretations of existing works, scores for silent films, and popular music arrangements, while also frequently engaging in free improvisation and game pieces. With funding from the Muriel Wolf and Albert Steger Endowment, Wooden Cities has also reconstructed several works from Buffalo's rich history or contemporary music, presenting works—such as Lejaren Hiller's Avalanche (1968)—which had not seen a performance for many years. 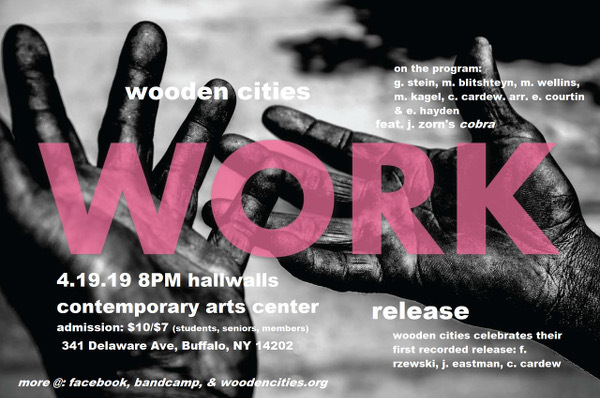 In 2018, Wooden Cities recorded its forthcoming album, Work, which features works by Cornelius Cardew, Julius Eastman, and Frederic Rzewski.